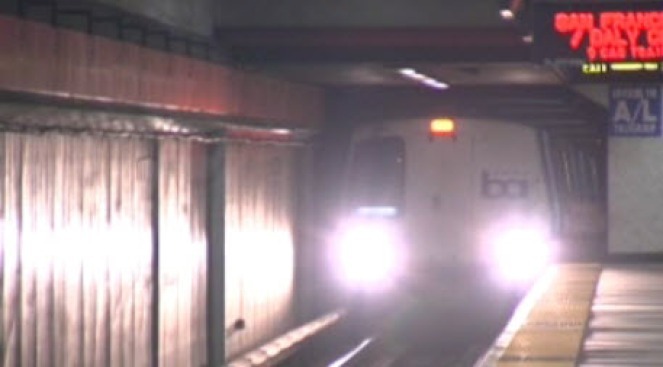 It has been 16 years since the last time BART workers walked off the job, but with each passing hour the threat of a strike seems more and more likely come Monday. The unions contract expires Sunday at midnight with a threatened strike to start the workweek commute. Saturday's negotiation session ended before 5 p.m. with the union saying that management was "a no show." A union spokesperson told gathered reporters in Oakland that a strike was likely. Union officials said they would move forward with plans for a BART strike on Monday after walking out of the contract talks today. "BART management is engaging in what is called "surface-bargaining," said Jose Mooney, spokesperson for Service Employees International Union 1021. "They're trying to appear in public like they are working to keep the trains running, but they're doing nothing to respond to good-faith offers by BART workers aimed at avoiding a strike." BART officials said they had told the union they would have a proposal ready by 5 p.m., but when they submitted it to the mediator at 3:45 p.m., they were told the negotiators had already walked out. BART spokesman Rick Rice said management delivered a new economic proposal to the mediator Saturday afternoon, and received a response from the union to a proposal made Thursday. He said the latest BART proposal increased the salary offer and reduced the amount employees would contribute to pensions and health care. "We're disappointed," Rice said of the union's decision to break off talks. Friday's negotiation sessions did not go well either. The session started late and ended at 10 p.m. with no reported progress. Talks are scheduled to begin at 11 a.m. each day. It was not clear if any talks would take place Sunday. Antonette Bryant with ATU Local 1555 said Saturday morning that negotiators had their suitcases packed and were prepared to stay at the bargaining table until a contract is negotiated and a potential strike was averted, but he session didn't last even six hours. On Friday, negotiations were supposed to begin at 11 a.m. but were delayed for hours. They were pushed off until after the BART Board of Directors’ meeting, set to end around 6:30 p.m. Both sides blamed the other for the stall. BART’s two employee unions, SEIU Local 1021 and ATU Local 1555, are asking for a higher salary increase: a five percent increase for the next three years, plus a cost-of-living adjustment. BART is offering a one percent increase for the next four years. The biggest concession from either side has been BART’s decision to remove conditions off of the increase and make it a guaranteed raise. Talks began April 1 and quickly soured. “We have been waiting since 11 a.m. We have not met with the district and we are still waiting,” said Antonette Brown, president of ATU Local 1555. But BART said the unions did not give a response to the agency’s latest proposal Thursday night, and as of 6 p.m. Friday, still had not heard back. Rick Rice, a BART spokesman, said the agency finished responding to every part of the unions’ requests, agreeing to half a dozen of them and changing others in hopes of moving the talks forward. Rice would not get into specifics. But union leaders are calling BART’s offer an “insult.” Brown said union members gave back more than 100 million dollars in concessions in 2009 and deserve to get paid back. Union members also don’t believe BART’s statement that the agency has no surplus. If talks don’t smooth out and a settlement cannot be reached by 11:59 p.m. Sunday, when the unions’ contracts expire, the strike is on. And that isn’t just stranding the estimated 400,000 people who ride BART every day. AC Transit workers may also go on strike Monday morning. It has an average of 175,000 riders every day. Other transit agencies are set to try and help, including Caltrain and SamTrans, but it won’t be nearly enough to prevent what could be gridlock on the roads. If there’s a strike, BART is set to offer a courtesy shuttle during peak commute hours, but that will only serve an estimated 2,000-4,000 people each direction each day. Riders are encouraged to plan ahead: telecommute and carpool. If people choose the latter, they can park in any of BART’s 33 station parking lots for free.